Anthony, a mortal always hungry for a bucket, stood behind the three-point line at the left wing, calmly waiting to be fed the ball by a point god—the point god Chris Paul. Paul found him, like Point Gods do, and threw him a pass for a trademark Rockets catch-and-shoot three. But instead of shooting, Anthony pumped fake, watched his poor defender fly by, and stepped in for a long midrange jumper. It was clearly a better look, a more open shot, a routine play for Carmelo Anthony. 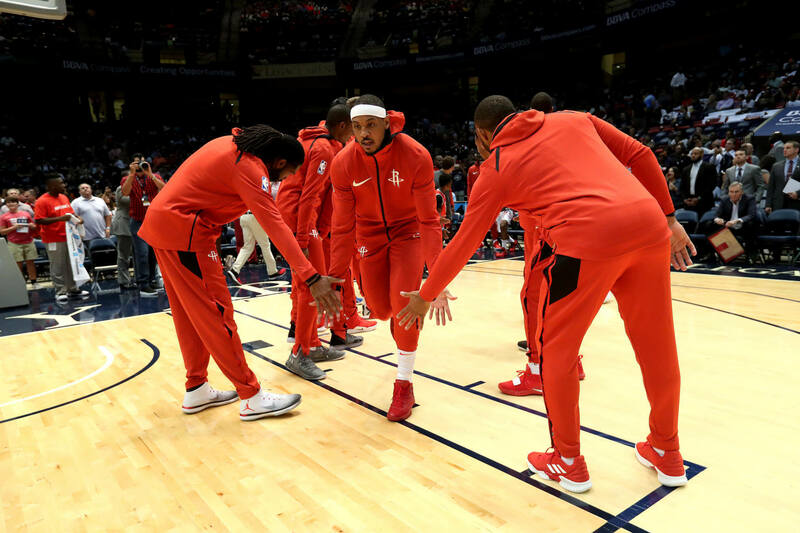 For the Rockets—a team that led the NBA in 3-pointers made and attempted in the last two seasons—it was a quiet rebellion. As Anthony ran back on “defense,” he looked over to the Rockets bench and said, “My bad” with a laugh. It was, perhaps, the first My Bad in the history of made baskets. It was, without a doubt, a landmark moment in the new Carmelo Anthony experience. “That’s just who I am. If I got it, I’m going to shoot that. I’ve been doing that for all my career,” he said after his Rockets debut, when asked about why he dared to travel to the deserted midrange island while wearing a Rockets jersey. Anthony is often criticized for being a one-dimensional player and plays in a style that is simply unapologetic. He knows his strength (scoring), and he’s going to exhaust all methods to maximize this strength, whether it be a contested fadeaway, a pull-up three, or (if you’re the Rockets) the dreaded midrange jumper. Give the ball to him on the elbow and you get either the jab step-jab step-pump fake-pull up combo or when he’s feeling extra: the jab step-jab step-jab step-pump fake-pull up combo. At 34 years old, Anthony is old school, a remnant of an old NBA that doesn’t want to evolve. His hashtag is #StayMe7o. He’s not about to change now. At least not totally. Apologizing to the bench for not sticking to the game plan of strictly drives and threes? That’s a good start. But to truly appreciate him, you’d have to accept that he is still that same alpha player from Denver (plus a few pounds and minus the explosiveness), and you’d have to be a fan of iso play. And video games. That’s where Midrange Melo and the Rockets system intersect. Anthony is the ultimate video game player in arcade mode, where the pursuit of self-expression is the main objective. The Rockets is the ultimate video game team that ticks all the boxes of fun gameplay: isos, alley-oops, corner threes, fastbreak threes, stepback threes. Adding Anthony to the Houston experiment is, um, no rocket science. The Rockets are masters in tinkering with the narrative and flipping the script. James Harden can’t be a point guard? Boom, he leads the league in assists with 11 a game. Chris Paul and Harden can’t co-exist? Boom, they win 65 games. Carmelo Anthony is washed and can’t fit in any system other than his own? We’ll see. In his failed stint in Oklahoma City Thunder, his numbers went down across the board, further sending his stocks to plunge. OKC made the playoffs, sure, but Anthony—for the first time in his career—was playing a small, almost insignificant role in the Thunder Big 3. He became a third wheel in the budding Russell Westbrook-Paul George bromance. He was asked about coming off the bench, which was like asking Kanye West to shut up. After his exit, Anthony tried to make sense of it by saying “everything was just so rushed,” which is what a person usually says when he or she is thrown into a less than ideal situation. He simply wasn’t comfortable in his role in OKC, and Uncomfy Melo is the worst of the Melo alter egos. With Houston, Anthony has a chance to turn it all around for his dwindling numbers, his growing critics, his crumbling legacy. The familiarity is there in offcourt BFF Paul and former coach Mike D’ Antoni. 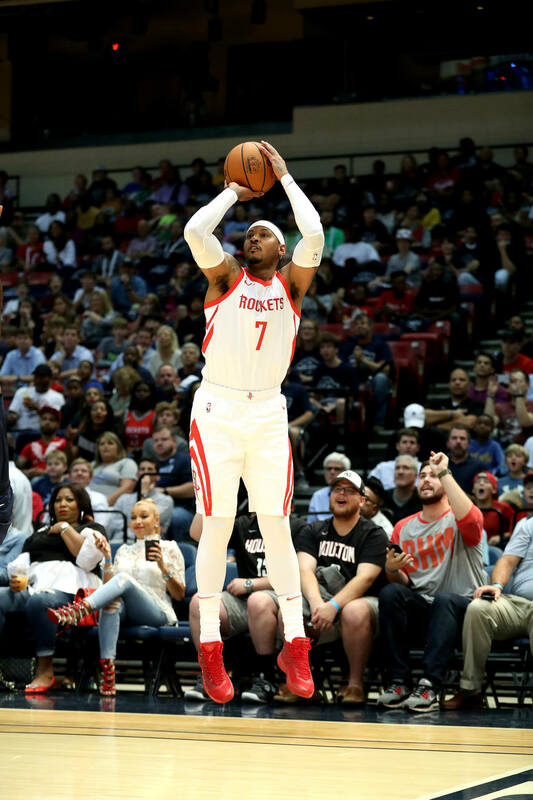 But thanks to MVP James Harden—a better, bearded version of what Carmelo Anthony should’ve been in New York—the pressure is off of Anthony in the narrative of “Can he fit in?” With Houston, Anthony just needs to hoop and be comfortable for the catch-and-shoot (or the catch-fake-and-shoot) to work. His midrange game is the easy target when trying to tear apart this new Houston gig, but wasn’t that the same thing that was said when Paul made his move to the Rockets last year? Look at the numbers and Paul’s and Anthony’s shot distribution isn’t that too far apart. Paul shot 46% of his shots from beyond the arc, 42% of his shots from midrange, and 11 percent near the rim, according to Cleaning the Glass. Anthony, on the other hand, took 39% of his shots from outside, 47% from inside the arc, and 15% around the rim. 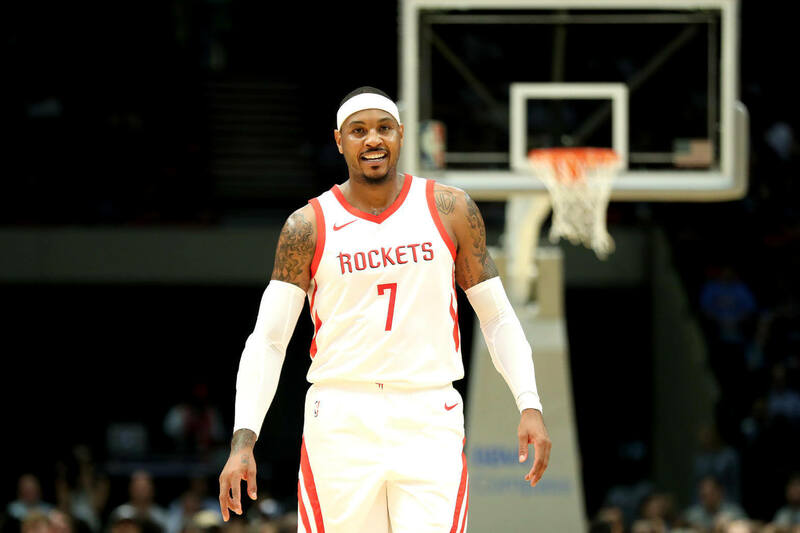 Now that he has two willing passers and genius playmakers in Paul and Harden, the expectation is that more of Anthony’s shots will come from three-point land, in the corner, wide-open. And if he’s not open? Hello, Midrange Melo. Don’t say this out loud for him to hear, but Anthony’s career is nearing its end. We can stop dreaming of seeing Olympic Melo and Hoodie Melo in the NBA because that’s never going to be happen. Those are extra-curricular activities that, while office sanctioned, didn’t really boost his workplace efficiency. Houston is his last shot to get the Finals, and to get there, Anthony should stop fighting the numbers. He’s no longer in Denver where he can trust his athleticism. He’s not in New York where he is forced to trust his teammates. In Houston, at 34, his legacy on the brink of decay, he should just trust the math.